Recipe first published on February 17th, 2012. Last updated on October 20th, 2015. If you follow me on instagram, you probably already know that Mack and I are currently soaking up all things fall in Illinois (M is at home working, so I promised him I’d make a pie upon return). Coming home always brings with it a bit more nostalgia, especially during fall. The feel of the crisp air, watching the leaves change, and being curled up in my youth bed (which is a three-quarters antique four-post bed that creeks amazingly loud with every move). And so I’ve let my nostalgia spill over to the blog by sharing these tacos (and another recipe on Thursday). Both are a couple of my favorite recipes from the archives that have been updated with new information and new photos. Hands down, this recipe is the most popular one from the site (with good reason). The chipotle seasoning is such a great pairing with the sweet potatoes and the guacamole helps balance the spice. It’s the type of meal that is hearty enough to sustain you through a winter day while still feeling fresh. The taco shells: When I originally posted these tacos, they were in a blue corn hard shell (as seen here). I actually prefer the crispness of the hardshell with these sweet potato tacos but it’s rare that I have them in the house so I usually eat them with soft shells. Use whichever you prefer! The guacamole: I’ve only made one change to the entire recipe over the years and it was to ditch the tomatoes. I’ve actually become a fan of not having tomatoes in my guacamole and with these tacos a good fall/winter treat- store bought tomatoes didn’t make a good addition. However, if you’re a tomato fan, you can definitely add them back in. 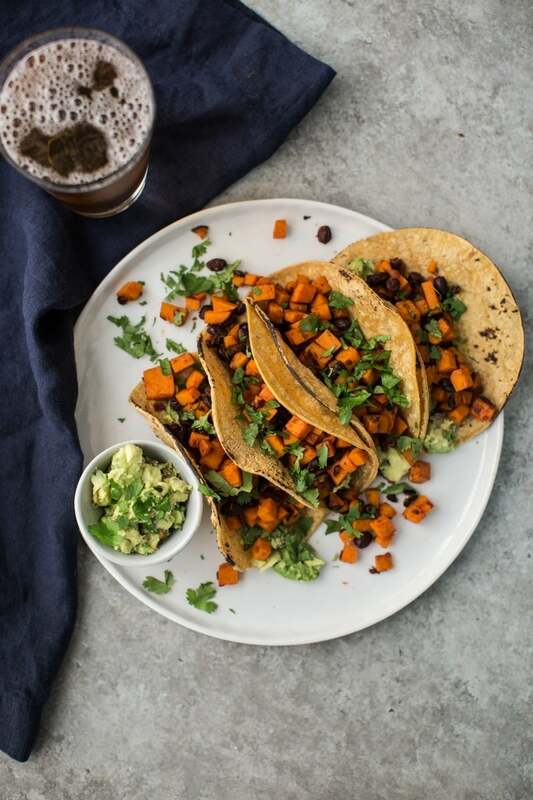 The sweet potato: I will always make these tacos with sweet potatoes because in my book, that’s what they are best with. However, if you have some cubed butternut squash or pumpkin you’re looking to use up, it would work well in these tacos. Make it a Soup: Melissa from The Fauxmartha used these tacos as inspiration to make a sweet potato taco soup. Make it vegan: Swap out the honey for your favorite sweetener and that’s it! I would recommend keeping some type of sweetener though, it helps to cut down the spice from the chipotle! Heat olive oil over medium heat in skillet. Add onions and let cook until onions begin to soften, 3-4 minutes. Next, stir in sweet potatoes and continue to cook for another 3-4 minutes. In a mortar and pestle, combine the chipotle, adobo sauce, honey, and lime juice. Break apart the chipotle into small pieces (alternatively, you can cut up the chipotle.) Pour into the pan with the sweet potatoes and reduce the heat to medium-low. Add beans and continue to cook until sweet potatoes have softened, 10-15 minutes. While sweet potatoes cook, scoop out the insides of the avocado. Add onions, garlic, pepper, salt, and lime juice. Mash until the guacamole has your favorite consistency. Fold in tomato and cilantro. Taste and add more salt if needed. To serve, scoop a spoonful of guacamole onto the bottom of the taco and layer with sweet potato mixture. Sprinkle extra cilantro on top if desired. I know, I want to use the chipotle-honey marinade on everything 🙂 We’ve been making similar tacos for a healthy, quick dinner around here. Yum! These seriously need to be in my life. I am freaking in love! Lovely! I adore chipotle and sweet potatoes. I often toss diced sweet potatoes with chipotles in adobo, roast, and use them to top salads. So delicious. Great photos too, lady. Looks great. Thank you! I have a feeling I’ll be eating this combo on salads once summer hits! This looks delicious. The adobo sauce, honey, lime combo is intriguing me. Absolutely making these next week! Just stumbled upon your blog and am so pleased that I did. It’s absolutely gorgeous! 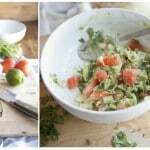 Awesome recipes and fantastic photos! 🙂 I too have a blog focusing on vegetarian & vegan food at thefigtree.blogspot.com 🙂 It’s nice to see someone share the same interests as me. Have a lovely day! Love everything about this meal! This is the first time I am at your blog. I was looking at the tacos and it looked so delicious. I like your blog. I have at LEAST three recipes on my blog that combine honey and chipotle…it really is a miraculous combo. And this shall surely be a fourth! Sounds SO tasty. Wow that looks amazing. I just finished subliminally making my boyfriend love avocado (he was not a fan at first. Something about it being green…) so I think he would love this recipe. Speaking of unprocessed, do you have your own recipe for making taco shells? Made this, more or less, the other night – it was sublime! I served the bean/sweet potato combo over a bed of quinoa, instead of as tacos, and added a diced orange to the guacamole mixture. Soooo good, and will definitely be making a frequent appearance in the rotation. That’s an awesome goal for your family! I think this is a great recipe to have in your rotation! Made this last night! The flavors were delicious and Guacamole and chipotle sauce really complemented each other nicely. Husband enjoyed as well. I definitely will be making again but will tweak the recipe a bit. One complaint I have is that the sweet potatoes took much longer than anticipated (I cut the potatoes really small too). I think I might try to cook the sweet potatoes in the oven with some chipotle adobo sauce (so you can walk away and not stand and watch them cook. Plus you get a little crispiness to the potatoes). Once they are done, through them into the onions, add the sauce and beans and then dinner is done. I think also I might like the guacamole on top instead of at the bottom, but that is just my preference. Thanks for the recipe!! Agreed. Was just checking comments to see if anyone else got stuck waiting for the potatoes to cook through! Beautiful recipe, though- Can’t wait till it’s ready!!! Uh oh- sorry to hear you’re having trouble getting the potatoes to cook. I wonder what’s happening. I’ve cooked this dish so many times without issue. What kind of pan are you using? I just made these and ate them and my boyfriend and I thought they were amazing! It had the perfect combination of sweet and spice. I recently started making healthier meals, but one of the problems I’ve encountered is that the food is often bland. Many blogs I’ve been to have recipes that sound and look good but require too many ingredients and time. This took me about a half hour and I had most of the ingredients. Thanks so much for posting something easy and delicious! You’re welcome! I’m so glad you enjoyed them! These look so amazing! 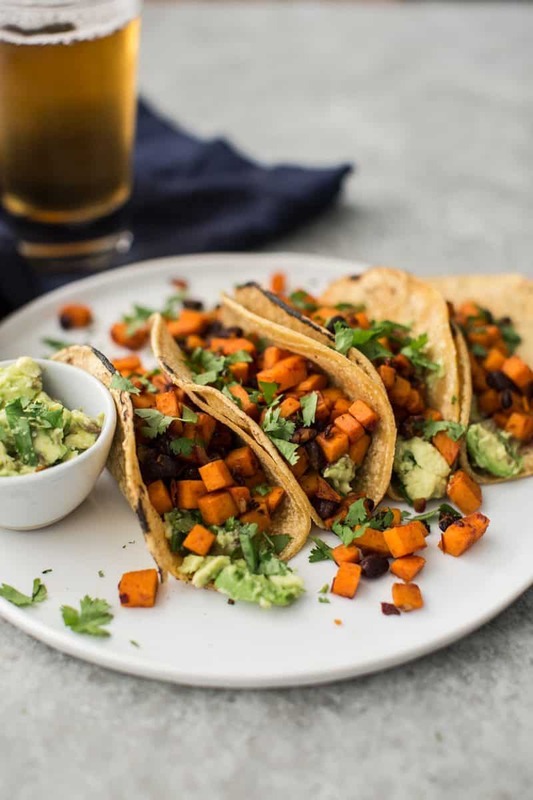 Recently had sweet potato tacos for the first time (with chicpeas) and these look equally delicious! My husband has recently gotten way more on board with vegetarian eating, mostly because of recipes like this one! He seriously kept saying … “I don’t know if I’ve ever tasted anything this good before…” Thank you! You’re welcome! That’s what I like to hear! Love these! I’ve made them twice this last week. Love the combination of the chipotle, honey and lime. I could eat that over and over. Made burritos with whole wheat tortillas, plain greek yogurt and a handful of fresh spinach. Was awesome! Thanks for a great recipe. My 12 year old, EXTREMELY picky, little sister ate these with us the other night. and actually LIKED them!! Definitely worth the work. Appeals to the entire palate- sweetness of the potatoes and honey, sourness from the lime and spiciness from the chipotle!! NOM NOM!!! Made these last night and they were SO good. Next time I’m making double. Wow..these look really interesting! Another favorite combination of mine is chipotle and raspberry. This is a great recipe, I made them twice already, they are delicious and really easy to make. Thank you, you saved my dinner tonight! Holy Moly! Saw this on pinterest and tried thm after a friend said she made them. These were delicious! Even my “sweet potato hating” husband loved them! Thank you for sharing! Guacamole + chipotle = tastttteeee. Love the blue corn tortillas and totally impressed you broke out the mortar and pestle instead of pulling the lazy me way with my food processor. I am not a vegetarian by any stretch of the imagination, but I do try and make healthy food choices and I am trying to go meatless several days a week for my cholesterol issue.. I don’t know what these will taste like, but my house smells amazing right now! If I don’t like the way they taste, what a great air freshener it makes!! Haha.. anyway.. love your site, it is giving me lots of ideas for great food to try!! OH MY!! Dinner is done! I don’t know how in the world you stopped at just 2!! These are amazing! Thanks!! This recipe is out of this world! It’s so refreshing to have something different, and you’re right – I didn’t miss the cheese, salsa or sour cream one bit! Thank you! I made these last week, and they were delish! I added ground turkey to the recipe in order to appease my husband, who refuses to eat a meal without meat. We enjoyed it, but I can’t wait to make them again without the turkey. Great recipe, thanks! These were so good. I love how the honey takes away that harsh taste of the chipotles in adobe sauce that I’m not fond of. Definitely making these again!! I just made this and seriously I’m 100% in love. So amazingly yummy. Thanks for the amazing recipe and ENTIRE WEBSITE! These were delicious!!! 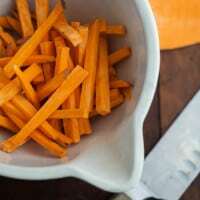 I’m planning on using the sweet potato mixture for breakfast burritos and just as a delicious side dish. So great!!!! Erin, these are seriously divine. I made a double batch for our super bowl party (we had shrimp & BBQ pork options as well) and I found myself indulging in these as my favorite! My boyfriend’s two young sons (one has a dairy issue & we suspect a gluten issue too like his dad) come over every weekend & we introduce them to a new veggie or two and healthier alternatives than they get the other five days a week. I know they love ground beef in their tacos, so I can see this mixture easily becoming little patties, quickly sauteed up in the skillet to go with an egg or two for a healthy weekend breakfast. I made up another double batch last evening & will be enjoying it over the next few days! I love how inexpensive, healthy, and delicious these are and will become a bi-weekly staple in my kitchen. These tacos are AMAZING. We made them last night and stuffed ourselves full! We used a whole 15 oz can of black beans just to avoid leftovers and the proportions were still perfect. SOOOO good. And fast! And easy! Thank you! Hi there! Thank you so much for sharing this recipe! It was an instant hit at my house and I’ve made a variation of it several times. I posted some pictures of the “taco salad” version on my blog (with links back to you), if you are interested Chipotle Sweet Potato and Black Bean Taco Salad . Honey Chipotle. SO YUMMY. I hope you’re loving Illinois and all the beautiful fall they’re having right now. These tacos look fantastic. I’m not usually a tomato in guac type of person, but I’ll allow it when the tomatoes are bright, juicy, acidic cherry tomatoes that are perfectly ripe. Ahh this looks so good! 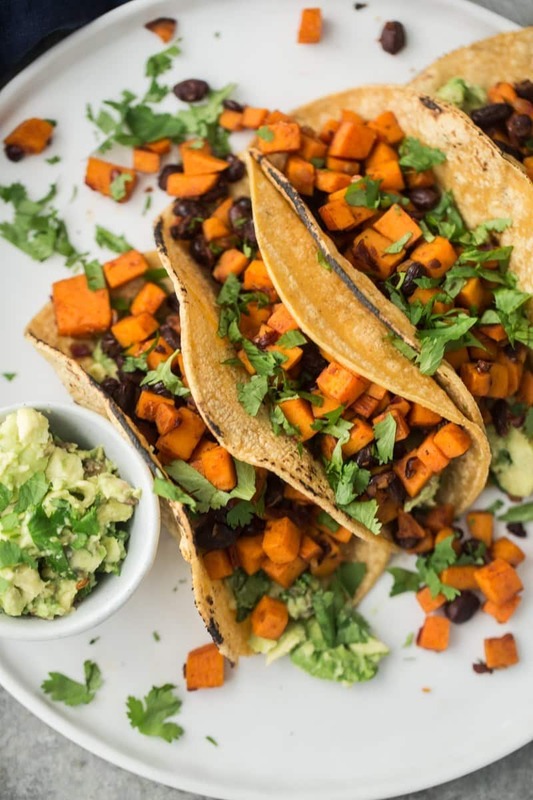 I never really thought of combining sweet potato and chipotle, but it really seems like a no-brainer now! This looks delicious and healthy. Thanks for sharing the recipe! Ahh!! Delicious!!! I love tacos!!! I LOVE this website. But two comments on this particular recipe–I can’t imagine using that much chipolte and adobo sauce. Just too, too hot. Also sweet potatoes take a lot longer to cook. I added water to steam sauté. I doubled the recipe and used a whole can of black beans, so as not to waste. Thanks for the comments Deb! I’ve never had trouble getting my sweet potatoes to cook but I always make sure they are 1/4″ cubed- good suggestion for those having trouble though. Congratulations for your site, is beautiful and complete, I was looking for vegetarian recipes for long, but I always find the same again and again and I was really disappointed, but just looking your first page I was excited, I want to try every recipe, and think this way can be difficult move on to vegetarian life. I love sweet potato and Squash and you did a great job with them. Thanks so much, I’m your follower right now. yep yep yep. just made your recipe and love it! i’ll need to tone down the heat for my gringo family, but thought the flavors were well balanced. thanks! 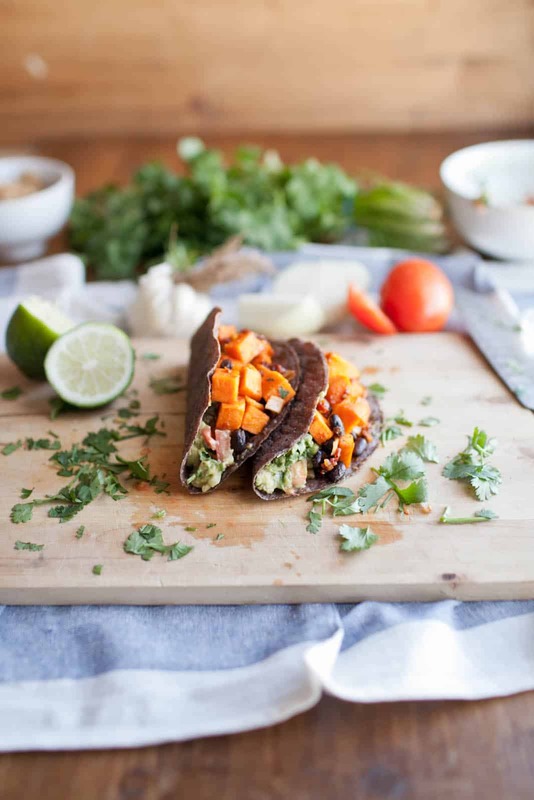 Hands down the BEST sweet potato black bean taco recipe I’ve ever found!! I am absolutely in love. I would give this 10 stars if I could. Made this for lunch today for the first time. Love at first bite. Love the heat with the sweet. I added a bit of greek yogurt/lime/cilantro sauce to the top too and liked the bit of coolness. Thanks for sharing this. Amazingly delicious!! I’m literally waiting for the last 15 min to be done and the tasty chipotle smell is killing me! I want to eat now! As a vegan (and mexican), I don’t need the honey but extra lime juice and believe me…It tastes great! As far as I can smell! lol!